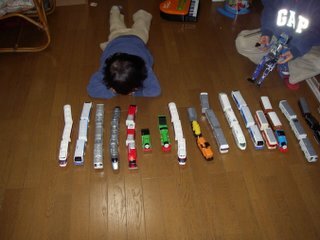 They read the cataloge of Tomy everyday. And they ask each other what they want to getfor their next christmas present. It is too early to talk about it. Yes, model trains are popular here too. "Why don't come over and see my blog?" Now I read your blog, and enjoy your pictures with my younger son. Thank you for information about trains. We are interested in them. I didn’t know puffing billy. Some day we want to go puffing billy .